← Wisdom Crew – what’s that about? This week we give you an insight to which gloves are used by our tour-guides. Being an official travel partner of BMW Motorrad, it is no surprise we tend to go for their products. That said, you will see we do not only use BMW brand. We select the most practical items and gear for our use and (unfortunately) we are not sponsored by BMW Motorrad and are not paid for testing or reviewing their products. The same applies to all other manufacturers. As Morocco’s weather is usually warm and hot, short and well ventilated gloves are more practical and that’s what we use most of the year. Besides, we also provide BMW certified off-road trainings and ride a fair amount off-road on our adventure tours, which also justify lighter gloves with a better feel for the controls. We have a stock of gloves from various manufacturers that we provide to our customers in need. However, our guides mostly use the BMW GS gloves. We have been using these for over 8 years through the various ranges. Although the last one was not a durable piece (they lasted about a year before the stitching started to give up), the latest series is a great piece of equipment. They are soft enough to be extremely comfy but still offer ample protection. Once wet, they dry very quickly and do not get stiff once they dry. You have a very good feeling for the controls and they are easy to remove and put on. During the colder months (January and February), when temperatures are lower in Atlas and we even can have rain, we opt for the GS Dry glove. This new addition to the BMW product line is a waterproof Goretex glove that keep the hands warm in colder weather. Obviously, we are not saying these are the best items on the market. We just share our experience. There are countries, where these gloves are perhaps too light or too warm, but in Morocco, you won’t need more than that. There are several manufacturers that offer great summer gloves, at various price points. When choosing yours, make sure it fits well and provides a good feel for the controls. it should be well ventilated and have protection on the top of the fingers and knuckles, as well as proper padding on the palms. 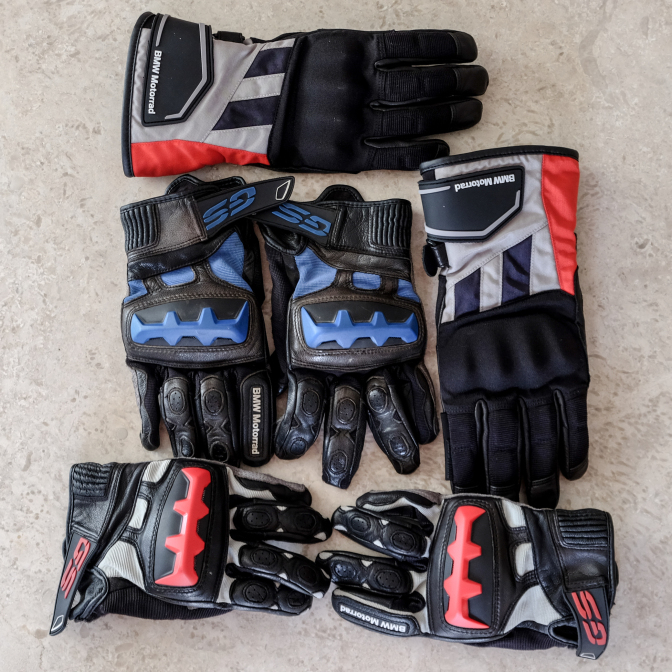 You should also ensure that the cuffs have a good fit – not too tight but not loose either and the glove must have an adjustable wrist strap to ensure it stays on in case you come off the bike. A glove is always an important element of your riding gear so make sure you choose wisely in terms of comfort and protection.